The company, Maggi Francecsco was founded around the 1940’s in the town of Montescano, a small reality of only 3 hectares in a time of great difficulty where war and poverty ruled. In the 1970’s, the current owners had an innovative idea of moving the head office to Canneto Pavese, the centre of the Oltrepò which is known for its grapes and its prestigious wines. Right from the start, the company has wanted to honour its tradition, its culture and the flavor of its hills and until now it respects such customs that skillfully guide the family business. 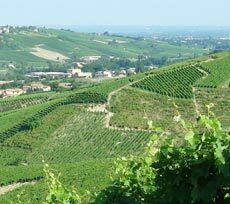 The company is spread out over 25 hectares of vineyards divded in four towns; Canneto Pavese, Montescano, Castana and Montu Beccaria. 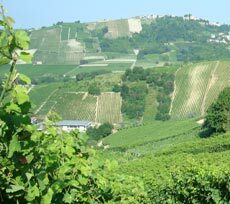 These areas are known for its excellent wines certified DOC such as Buttafuoco, Sangue di Giuda, Bonarda, Barbera, Pinot Noir, Pinot Chardonnay, Riesling, Muscat and last but not least, the superb, Historic Buttafuoco. To achieve these objectives, the grape harvest is done painstakingly by hand to keep the skins intact until the grape crushing which is done at a controlled temperature in the winery. The pruning is a fundamental operation for the production of important wines and is carried out exclusively by a few experienced people. We like to remind ourselves that our work is closely connected to the climate conditions and that its help, we can achieve a product more or less the same in quality as the year before. It’s important to highlight also that wine shouldn’t always be the same. Rather, if it’s made with true and genuine viticulture criterias, it should change from year to year since the harvest is never the same as the year before whether it be in the quantity nor the quality. Our fundamental objective is to maintain a relationship of trust with our clientele, in particular with our individual clients, that make up around 70% of our sales. These clients and old-fashioned but efficient word-of-mouth have always praised our efforts for producing quality wine.